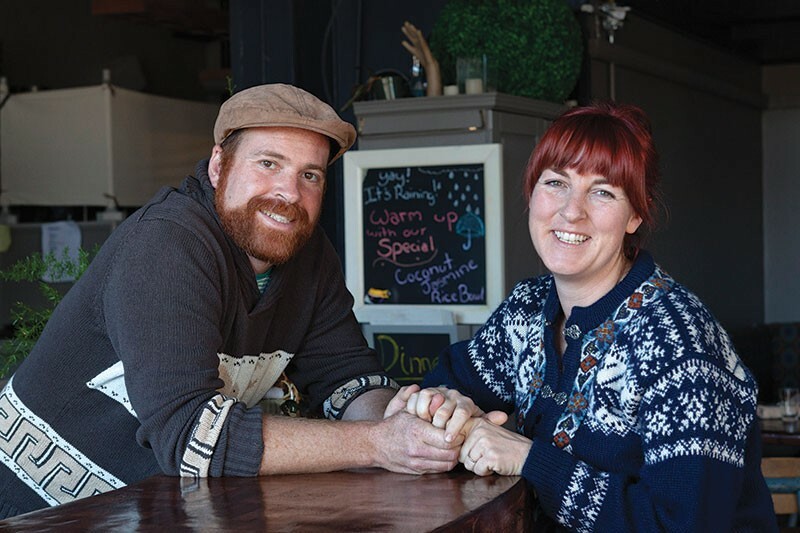 TWO COOKS Husband and wife Josh Norwitt and Miriam Donaldson opened Wishbone in the former Three Cooks Cafe space in Petaluma. In 1959, restaurateurs June and Jerry Norwitt took a drive north from San Francisco, lured by the vision of a rural, Bonanza-like lifestyle. Within a day, the couple found 160 acres of hilly land on Roblar Road in northern Petaluma and bought it for $30,000. Cash. They wound up raising two sons and 200 sheep on the ranch. Over 50 years later, their grandson Josh Norwitt and his wife, Miriam Donaldson, are reliving the dream—except this time around, the two artist-and-musicians-turned-restaurateurs, who recently opened Wishbone in Petaluma, moved to the ranch from San Diego, lured mostly by the vision of (gasp!) a rent-free place to live. They christened it the Tilted Ranch because, as Donaldson points out, "There's no barn, hardly any fences, not much infrastructure. It's a rough piece of property. It's not your typical ranch." Which is part of what makes it so lovely. On a recent Tuesday I'm lucky enough to be picnicking at the ranch's apex, a gentle mountain of scrubby grass and ancient rocks that offers a 360-degree panorama of the county. "There's Santa Rosa and there's Rohnert Park," Donaldson says, pointing, "and if you have a drink and squint just right, you can even see the coast out there." She hands out hunks of seeded bread and blackberries. Norwitt periodically chases after their two-year-old nephew, Leto, named after the worm God-Emperor from the Dune books. Tippy-Suzie, the last of the ancestral Norwitt cows and the sole limousin breed, roams the land with some 30 Scottish Highland cattle—the source of every steak, burger and pâté plate served at Wishbone. Near the thick of trees they call "the Brain" ("a neat, Hobbity place," explains Donaldson) sits the trailer that she and Norwitt lived in for three years while running their first restaurant, Humble Pie, in Penngrove. Some nights, jonesing to watch a movie after work, they'd use a car battery for juice. They've since upgraded to a cozy little house, built mostly by Norwitt, with cathedral ceilings, paint swatches on the walls and jars of fermenting kraut on the porch. In late 2010, when they lost their lease at Humble Pie (which shared a building with the Black Cat Bar) just weeks after Poppy was born, people mourned the loss of Donaldson's biscuits and homemade ketchup. Next came Blue Label, which they essentially inherited after helping Bill Cordell, who abruptly bowed out, launch the place. "We never intended on getting that deep into it," Norwitt explains. Donaldson chimes in: "Even though someone was handing us a restaurant, we wanted something that was actually our brainchild." So after a few months of serving sublime truffle egg biscuits in the sunny spot above the Belvedere, they went back to the ranch, raising cattle, raising Poppy. A few years later, Wishbone came true, thanks to a few investors, including two Humble Pie regulars.